Work on the 1925 house is underway. Soon it will have a kitchen, utility room and a heating system. Which is good. The more I look at older houses the stronger my belief becomes that architects in former times were carpenters by training. The walls present certain technical problems in terms of structural requirements, but they mainly serve as a stage for the finer items – windows, doors, stairs, skirtings and mouldings. Look also at the use of the floors not just as structure elements but also the detailing of the openings – at the landings for example. In carpentry, once the need for robust sections and strong joints is understood, the opportunities for variation and decoration present themselves very readily. The timber can be easily worked to create profiles, returns (where a timber element turns a corner) and fancy work such as relief carving, applied and cut in patterns. The hierarchy of structural elements – stronger and thinner – suggests a related hierarchy in terms of the decorative elements – delicate, fine or robust – which seems to have a proportionate and natural sense of rightness about it. Follow the fireplaces through the house and we can see that the dark and heavy relief carving of the reception rooms progresses to a lightness and delicacy in the bedrooms. Nice. Another reason why I see carpentry in the design of these buildings is in the roofs. I have talked a little about this before but a pitched roof, made of timber, follows certain key principles in it’s design. In it’s simplest form horizontal timbers are laid on to the top of the walls and a long horizontal board is propped up in position at the ridge by sloping timbers – so that’s the wall plates, the ridge board and the rafters. We fix long strips of wood – the tile battens – to the rafters and nail the roof tiles to them so that they overlap and let the rain run off into the gutter below. These houses transcend that in terms of their design, with hip ends (the roof ends are pitched with rafters, not with a gable wall), projecting gables and dropped eaves. The carpentry is complex but cleanly resolved. What I find most impressive is the subtlety with which the walls respond to and create the roof patterns that rise above them. Certain geometrical aspects are fixed as laws which if broken create consequences for the subsequent parts of the roof. The ridge and wall plate must be level and true. If the ridge rises, or the wall plates drift apart, the tile battens will not be parallel and the tiles, which are of uniform size, won’t overlap properly. Other elements can be varied to create effects. A projecting wing will get a ridge of it’s own and the height of that ridge depends on the width of the wing – a wide projecting wing gets a high ridge and a big gable, a narrow one gets a low ridge and a small gable. We can step these one in front, one behind. We can also drop the wall plate to bring the roof down (or raise it to go up). You often see this on smaller houses with simple roofs, where the street front looks a little taller and more impressive without using up so many expensive bricks at the back. 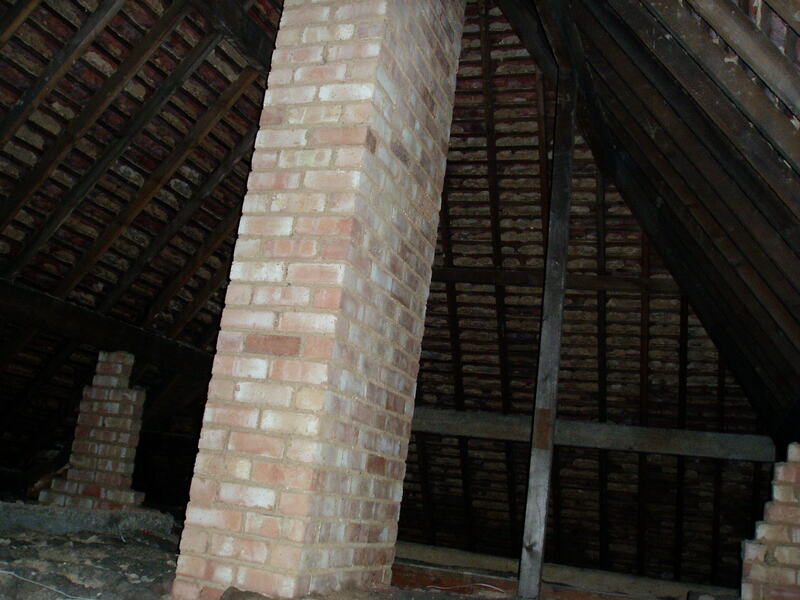 But this is a rule with a consequence – either the ridge board moves towards the high wall plate or the rafters from the low side have to get steeper. You see the latter on smaller houses sometimes, but if these walls return (turn a corner) you get a gable whose apex is off centre. Complex pitched roofs have equal pitches and they create their complexity by the subtle arrangement of the wall plates and walls below. To create a structure of this nature the designer must have a deep understanding of roof carpentry.